I finally saw “Andy Warhol—From A to B and Back Again” today at the Whitney Museum of American Art. I decided to go last minute, only to learn that this was the last weekend. Online tickets were sold out. When I arrived on this glorious spring day, hoards of bony fashionistas—fresh from strolls on the High Line—gathered at the entrance on Gansevoort Street. Did I really want to pay $25 for a case of hipster claustrophobia? Before I could turn away, artily dressed staff swiftly corralled us from the sidewalk to the front desk to the elevators to actual gallery space featuring iconic floor-to-ceiling prints. This waiting process took 15 minutes for the un-ticketed and un-membershipped folks like me. I have to salute the staff’s cheerful efficiency. Eye-to-eye with true Americana, I was gobsmacked by the artist’s body of work. From sponsoring the band, The Velvet Underground, to experimenting with unflinching videos of his mother Julia Warhola in bed, Warhol kept surprising me. 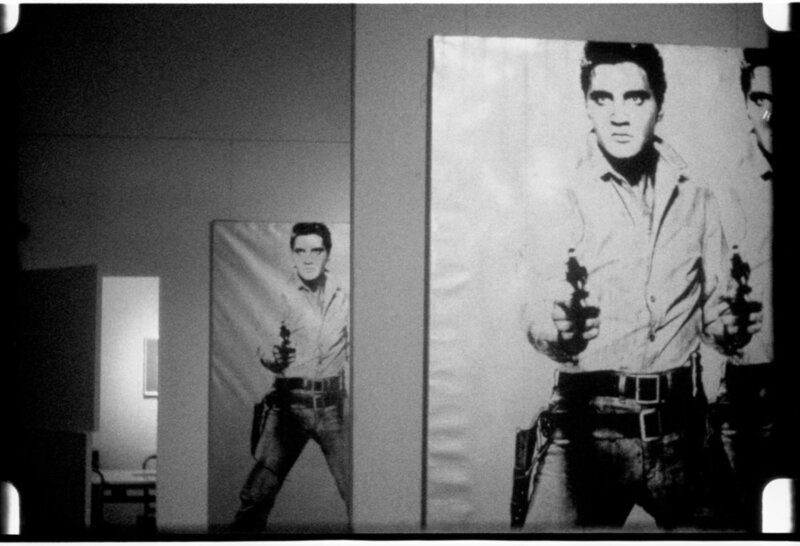 I loved the print of Elvis in triplicate and the same gunslinging Elvis by himself in his own individual frame. With massive white wall space, the Whitney beautifully displayed the cowboy Elvises together. But I also enjoyed watching a video of Warhol consuming a hamburger and then staring at the camera. Was this the beginning of social media, exploiting the human desire to gawk? Certainly, I was bumped into more times than on a Circle Line cruise in June. I need a massage after all that rubbernecking. A close-up of a man’s private parts and organs of elimination was difficult to decipher. Then I stood away and figured out what was going on. So did a boy of about 10 whose eyes grew round before he got bored of anatomy and moved onto billboard-sized Rorschach paintings in gold and black. I flinched when I saw the silkscreen series derived from the actual photo of a suicide victim, a bookkeeper who jumped from the Empire State Building and landed lifeless on a car. I felt disgusted when I peered at a mural for the 1964 World’s Fair, Thirteen Most Wanted Men, which beautified murderers on the FBI’s most wanted list. But I laughed out loud when I spied Ethel Scull 36 Times. Her vibrant gestures and expressions were like a bouquet. So were Warhol’s commercial drawings for shoes and his parody ads for wigs and rhinoplasties. Warhol took risks. And he had so much to say about fame and self obsession. My self was uncomfortable. Elbowed one time too many by patrons in designer labels, I felt like a piece of chicken in a can of Campbell’s soup. And I couldn’t get anywhere near those images. Too many Instagram-users needed the wall space.